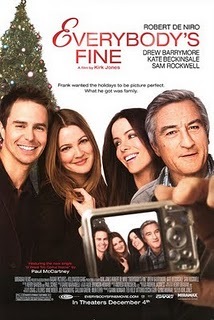 Everybody's Fine has one of those titles that describes the audience walking out after a viewing. It's not offensive. It's not crude. It's not likely to offend anybody. Everybody will be fine walking out of it. It doesn't push any boundaries and it follows a fairly typical dramatic formula, but it still works. There are better movies to see this holiday season, but you won't hate yourself if you choose this one. The film follows Frank Goode (Robert De Niro), a recent widower and father of four. He's planning on all of his children coming to visit him, but for some reason they all call and cancel with little to no explanation. Because he desires to see his children so much, he decides to surprise them by packing up and traveling to each of their respective locations. Although his son David is not home, he is able to see Rosie (Drew Barrymore), Amy (Kate Beckinsale) and Robert (Sam Rockwell). He loves them more than anything in the world and only wants them to be happy, but they all lie to him for various reasons and he finds himself emotionally distraught and disappointed that his own children can't even confide in him. And that's the largest flaw of this otherwise enjoyable film. Although there are various reasons as to why Frank's children are lying to him (one plays a major role in the unraveling of a mystery that I will not spoil), the one that struck me as odd is that they've all lied to him about their own personal lives for as long as they've been on their own. Robert tells his dad he's a conductor, but he's not. He just bangs a drum in percussion. Rosie invites Frank to her home in Vegas, but the huge place she claims as her own is actually borrowed from someone else. Amy has split up with her husband and is dating a new man. Frank doesn't know any of this and finds it all out on his visits, but the question that kept lingering through my head was, why? Why do they have this compulsive need to lie to their father? They lie to him as if he's this evil person that will condemn them for not being huge successes, but there's never any indication that they should feel this way. As far as the viewer can tell, he loves them more than anything in the world. "You pushed us too hard," Rosie says at one point in the movie, as if this one line of dialogue makes up for the lack of reasoning. It doesn't. By the time any explanation comes, it's too little, too late. The reason this is such a big deal is because the final emotional payoff doesn't have the same effect it would have had otherwise. Though still sweet due to an overarching motif, the rest of the lead-up does little to get you ready for that emotional punch. It still works, but just think how great it could have been had everything else been more fine tuned. Those are significant problems, but anything else is too minor to even mention because, fortunately, this is a good movie. It really captures the life of an old man dealing with the loss of his beloved wife and the unbearable loneliness he feels from being away from his children. Although he claims not to, he walks the halls of his home talking to his wife as if she's still alive, right there by his side. He misses her so much, and perhaps because he's so lonely, he takes comfort in hearing a voice, even if its his own. The best and most hilarious example of how the film really captures the essence of an elderly person is through Frank's excessive snapshots. He takes a ton of pictures because he wants these memories to last. The pictures work as a means to keep him company because if he can't have his children there with him, he wants to at least have pictures. Personally, I hate family photos and I loathe it when an aunt or grandmother forces me into one, but that is why this worked so well. As I hate being in pictures, so do the kids. The real draw of the film, however, is Robert De Niro. A veteran actor who has been in some of the greatest movies of all time (Casino, Goodfellas and the upcoming Machete—ok, maybe not the last one), De Niro has perfected his craft and does a wonderful job in his role here, showing a broad range of emotion through the smallest of subtleties. He takes what could have been a trite, contrived drama and puts enough heart into it to make it seem authentic. In a way, this movie reminds of me About Schmidt, the terrific 2002 film starring Jack Nicholson. Although different in tone, both deal with an old man forced to live a life he does not desire. Both have lost their wives and their children are off on their own. Everybody's Fine isn't quite as good as About Schmidt, but it's a pleasant piece of fluff entertainment that's sure to delight its intended audience.